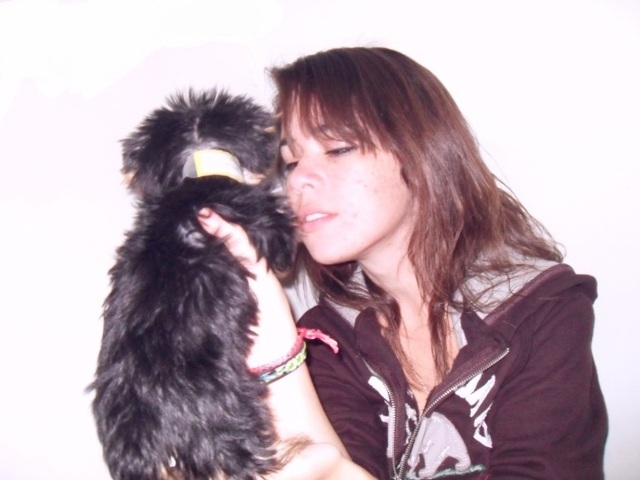 A girl holding a yorkshire terrier, trying to look at it's face. For me this photograph misses the mark in a number of ways. Firstly technicals - the photo is somewhat over exposed, and this causes problems particularly with the forearm - I am not sure if this was in camera or in processing, but either way is something you might want to consider in future entries. the photo overall is a tad on the soft side; I don't think this is a problem with focussing, rather that nearly all digital photographs require a degree of sharpening in post-processing, and I don't think you have gone far enough. I understand the title in relation to the photo, and do feel it meets the challenge, but am not still not sure the photo really works. I elected to use a rating table to decide on what value to assign during voting. yes, subjects are cute, pic meets the challenge. But a blown-out shot will not do well on this site. Pup doesn't look too happy from what I can see in his body language. Colors look very washed out on my screen. This is a great shot! Maybe a little bit more focus would work here. Out of focus and flat looking image there's not a lot of detail to see. There's an interaction but its not really interesting. Proudly hosted by Sargasso Networks. Current Server Time: 04/23/2019 08:32:03 PM EDT.